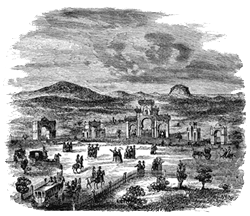 Among the most arcane of Bay Area historical landmarks is the site of the Broderick-Terry duel, September 13, 1859. Designated California State Historical Landmark No. 19, two granite shafts mark the spots near Lake Merced (1100 Lake Merced Boulevard, Daly City) where two distinguished pioneer gentlemen stood in defense of their honor. Born in Washington, D.C., David C. Broderick grew up in New York City, where he apprenticed in his father’s profession as a stonecutter, served as foreman for the New York City Fire Department’s Howard Engine Company (No. 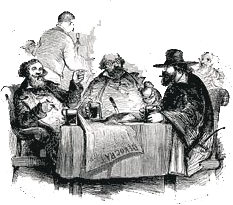 34) and—as at least any brewer can appreciate—owned a porterhouse (on Barrow near Howard), where friends would gather to discuss Tammany Hall politics. In 1849, his political aspirations took him all the way to San Francisco, where the politics of patronage he had learned back East would eventually elevate him to the status of U.S. Senator. Upon his arrival in gold rush San Francisco, Broderick began minting five and ten-dollar gold coins—containing four and eight dollars worth of gold respectively—a scheme that would soon provide him with the cash necessary to fuel his nascent political career. A deep rift developed within the Democratic Party in the late 1850s over whether Kansas should be admitted to the Union as a slave or free state. Californians of Southern nativity and proclivity, like State Supreme Court Justice David S. Terry and U.S. Senator William M. Gwin, sided with the Lecompton wing of the Democratic Party—favoring the pro-slavery constitution framed at Lecompton, Kansas—while Northerners like Broderick, whose dying words were reputed to be that, “they killed me because I was opposed to the extension of slavery and the corruption of justice,” took a more enlightened antebellum stand. Thus began a chain of events that would see Perley challenge Broderick to a duel in defense of Terry’s honor, and Broderick refuse in order, perhaps, to bait his arch-rival within the democratic party, Senator Gwin, into a duel. This plan, if indeed it was Broderick’s plan “to kill old Gwin,” was thwarted when Terry himself challenged Broderick, to what would be the last duel in San Francisco history. Hair trigger or frayed nerves? The sun was just rising above the neighboring low hills. Mr. Broderick was placed with his back to the sun, Judge Terry facing it. 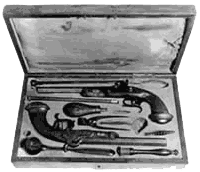 The pistols were carefully examined by the seconds, then loaded—Mr. Broderick’s by the armorer, and Judge Terry’s by his friend Sam. H. Brooks—and handed to the principals. Judge Terry took his, held it behind him for a moment, and then rested it on his left arm in front. Mr. Broderick critically examined his pistol, and took pains deliberately to adjust it to his grip. Apparently satisfied, at length, he attentively measured with keen look the ground between his adversary and himself, both ways, to and from him. The two had cast off their overcoats, and were quite similarly dressed, in full black suits, with frock-coats buttoned across the breast, and without shirt-collars. Mr. Benham examined Mr. Broderick’s person to see that he wore nothing to stop or glance a bullet; Colonel McKibben similarly examined Judge Terry. Mr. Broderick had just before handed his watch and the money in his pockets to McKibben, and Judge Terry had likewise passed the contents of his pockets to Benham. The word, as it was to be given, was exemplified by Mr. Colton, and repeated by Mr. Benham. The seconds then took their appropriate places. Judge Terry stood erect and firm, but in easy attitude, with his body accurately sideways to his antagonist, his pistol-arm hanging naturally, close to his person, with apparent readiness for full play to every muscle, his pistol in exact vertical position, and his legs precisely in line. His look was directed full toward Mr. Broderick, and his facial expression was of imperturbable composure, alive to the serious matter in hand. Mr. Broderick’s whole frame revealed the tremendous power of his determination, and his face, pallid from the wasted condition of his system, incident to the exhaustion of the fatiguing and terrific campaign he had so recently concluded, showed the prodigious force of his will in the mastery of his shattered nerves, now held as in wonderful strain of rigidity. There was not the tremor of a fiber from crown to sole. But his rigor of body was so severe that he had not easy command of motion, or essential play of action of trunk or limb. He stood as a marvelous complication of mortal clay and nerve so delicately and yet so stoutly fashioned that, while no deadly peril could affect it, no external force could shock it, the slightest internal disturbance would disconcert it all. 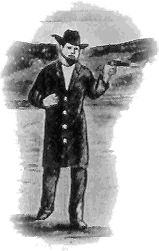 It was observed by the seconds of Judge Terry, that Mr. Broderick held his pistol, not vertically, as the articles required, but pointed outward in obtuse angle, and to this defect Mr. Benham called the attention of Colonel McKibben, who immediately went to Mr. Broderick’s side to rectify the wrong. His rigor of frame was so intense that, in the effort to adjust his pistol to the required position, he was obliged to use his left hand to bring his right arm into proper form; and in the effort he also so swerved his whole body that his right leg was pressed out of place, downward and forward, out of line with the left leg, and his chest was thrown out and quartering toward his antagonist, so as to present a larger surface for the chance of a shot aimed at him. He held his pistol in vise-like grip; and his wrist, instead of being in condition for ease of motion, was as an iron bolt, to move only with and as rigidly as the arm. He seemed the impersonation of that order of courage which faces death without terror, which prefers doom to the reproach of fear. Like Wellington’s intrepid soldier, he was conscious of his peril, but braved it. 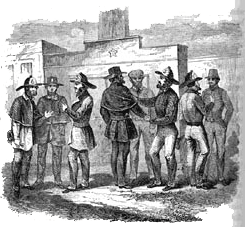 At nearly 7 o’clock that fated Tuesday morning, every other procedure of the awful scene having been adequately performed according to the articles, Mr. David Colton, the second of Mr. Broderick, upon whom the painful duty had been imposed, put the dread question, preliminary to the “word,” “Gentlemen, are you ready?” Instantly the response came from Judge Terry, “Ready,” in firm, natural tone of voice, and without play of feature or movement of muscle. Mr. Broderick did not respond at once, but again occupied a few moments in adjusting his pistol. This done, evidently to his satisfaction, he spoke the word “Ready,” accompanied by a gesture and a nod, as of assent to Mr. Colton. Then came the “word,” “Fire-one-two.” The pause between the words was as that between the striking of the hours of “the cathedral clock,” as a critical observer described it. Almost at the “one,” Mr. Broderick fired. The ball from his pistol entered the ground just nine feet from where he stood, in a true line with his antagonist. Judge Terry fired before “two” had been uttered. A slight show of dust upon the right lapel of Mr. Broderick’s buttoned coat gave token where the ball had struck. In a moment Mr. Broderick’s right arm was raised nearly in line from his shoulder and extended at full length; the left arm simultaneously moved in similar manner. In his right hand he still gripped his pistol. A visible shuddering of the body was instantly preceptible [sic], then a violent contraction of the right arm, a relaxation of the fingers of the right hand, from which the pistol dropped to the ground. A heavy convulsion shook his quivering form, he turned toward the left, his head drooped, his body sunk, his left knee first gave away, then the right, and in a moment he was half-prostrate on the sod, his left arm supporting him from falling prone. His seconds rushed to his aid. His surgeon was with him in a flash, but it was soon manifest that he had been somewhat confused by the scene. Judge Terry stood with folded arms in his appointed place, awaiting the requirements of the situation. His seconds went to him at once, and he remarked to Mr. Benham that his ball had “hit too far out” to be mortal; he believed it to be no more than a flesh wound, over the chest, and not dangerous, for no blood had flowed from Mr. Broderick’s mouth, as is the case in instances where the lungs are penetrated…. Senator Broderick received his wound, Tuesday morning, September 13th, at about 7 o’clock. It was not considered mortal at the time. Subsequent examination by the surgeons developed its dangerous nature. He had complained of a pain in his left lung to Dr. Hammond, on the tragic field; but that gentleman and Dr. Loehr alike believed it not serious. All the indications were to the contrary. Closer examination, under circumstances better adapted to the occasion, demonstrated the error of this belief. Still, during Wednesday and Thursday, there were hopes of his recovery. These were dissipated Thursday night; and at 9:20 o’clock, the morning of Friday, the 16th of the same month, he died. Fated and fatal Friday to him. It was on a Friday, also, something more than two years before, he had been chosen a Senator of the United States, the pinnacle of his life’s ambition, the consummation of his many years of struggle and study and toil, such as no other mortal ever endured or ever triumphed over. Now he lay dead, in his fortieth year, in the full vigor of life’s prime, in the height of his own marked career, and upon the very verge of the yet higher and yet grander field he was so likely to be called, in making his name still more famous, and building for himself a monument more enduring than stone, prouder than his own prideful and aspiring spirit had in earlier years ever dared to soar in its ambitious flights, limitless in its world-wide scope. 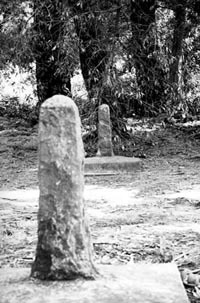 Two granite shafts still mark the spot near Lake Merced where two distinguished pioneer gentlemen stood in defense of their honor. David Terry was not to receive such encomia when, in 1889—long after the Civil War had resolved the slavery question, with San Francisco overwhelmingly in support of the party of Lincoln—he finally met his fate. Bellicose to the end, Terry was shot to death by the bodyguard of U.S. Supreme Court Justice Stephen J. Field in a train depot near Stockton, after Terry slapped Field in the face.